With the Ten of Swords, the development of human intellect has consequently reached its last step - from the birth of intellect within the Ace to complete ruin within the grounds of the Ten. The card teaches the lesson that endless fighting ends with destruction, endless analysis with the copmplete loss of hope and belief. It forces the lesson of the Nine of Swords to its inevitable conclusion. But with the Sun above it, it does not lack every hope. It will silently return to its origin again, to the first spark of mind in the Ace, to start all over again. The big hope in here is that the lessons from the journey absolved won't get forgotten. 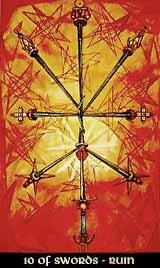 By the way, every Ten in the Minor Arcana stands for the end of a process, for the need to restart or at least variate, only the Ten of Swords have an amazingly crude way to put it into words - that's just the way they are.